There is no better place to view a sunset in Kerala than the Kozhikode beach. The beguiling ebullience of this beach makes it a much sought after tourist spot. A very old lighthouse, a marine aquarium and a lions’ park are other attractions of this most celebrated beach. 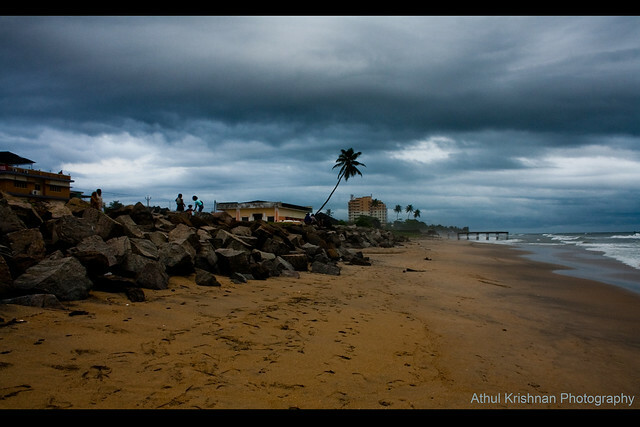 It is just 1 km away from the railway station of Kozhikode which makes it easily accessible. If you look at this city beach as a quick escape from crowded malls and busy streets, the beach itself gets fairly crowded during evenings and weekends. On the plus side, there are walkways, interesting statues, kid’s park and eateries. Marine Aquarium is also near. This is an old port. The two piers have disintegrated overtime although remnants still jut out of water. The major downside is that you cannot swim here. Sunsets at Kozhikode beach are legendary, if only you can overlook the occasional broken glass bottles and litter.